From its dramatic waterfront location on Turner Bay, Seashore Allure enjoys breathtaking ocean views dotted with the green islands of Little and Great St. James in the blue distance. Just completed in late 2010 and located on the outskirts of Cruz Bay, Seashore Allure is a luxurious but small and intimate complex offering just eight stunning, soundproofed condo units. Gentle waves whisper on the pebble beach, rippling in from the crystal-clear bay. Situated on the second floor of Seashore Allure is Abalone, a stunning two-bedroom condo featuring central air-conditioning throughout, two sumptuous king bedroom/bath suites and so many guest amenities. Warm Brazilian hardwood flooring and cabinetry serve as a rich backdrop for Abalone's elegant and modern furnishings, artistic lighting and excellent floor plan. The fully-equipped sleek and spacious kitchen features granite countertops lined with upholstered bar stools, stainless steel appliances, and has just about everything you might need to create a simple snack to a gourmet meal. The living/dining area is furnished with a large sectional leather sofa with electronic reclining seats for plush power lounging in front of the 55-inch high-def flat-screen TV. Two bedrooms, each with a king-sized sleigh bed and an ensuite bath, invite romance and relaxation in deluxe style. The master king bedroom looks out to a dazzling ocean panorama. Its adjoining bath is beautifully laid out in travertine tile with granite countertops, offering a glassed-in shower, jacuzzi bathtub and a bidet. The second king bedroom features a bath with a double vanity and a large walk-in shower of native bluebit stone and artistic tile work. Step outside to Abalone's private verandah set with comfortable seating; it overlooks the pool area and sunkissed Turner Bay. The verandah's clear tempered glass half-walls allow you uninterrupted vistas from your shady private spot, just perfect for reading, admiring the ocean view, or for evening cocktails. Should your friends or extended family wish to have their own accommodations, they can rent other units just steps from Abalone, so everyone has their own beautiful space and privacy. Steps from your door is Seashore Allure's convivial pool and entertainment area, where all guests are welcome to hang out. The marine-blue pool, set into a coralstone terrace, gets sun all day long. Nearby is a thatched pavilion which offers a shaded area with a gas grill and a 46-inch satellite TV, and there are tables for alfresco dining. There's also a convenient powder room and shower. And at the very top of Seashore Allure is a spiral staircase which leads up to a partially-roofed patio and the complex's large hot tub and lounge area. A stone archway frames the picture-perfect ocean view seen from this level. On the premises is also the condo office (manned from 9 a.m. to 5 p.m.), where you can get information and assistance and use the printer to print out your boarding passes. -Villa rental rates are based on two persons per bedroom. -Up to 2 infants under 24 months may be permitted above headcount at selected villas; please inquire. -Information and rates are subject to change at any time. -Weekly and nightly villa rental rates listed do not include government hotel tax of 10%. -Maid Service Frequency -Once per week (with rentals of 7 nights or more). Add $75 per visit for any additional maid services desired. -Seashore Allure is exceedingly polished and sophisticated and sure to please its fortunate guests. A flat walking path from Seashore Allure takes you through a local neighborhood and a nature preserve into Cruz Bay in about 10 minutes, for shopping, dining, bars and nightlife (or drive into Cruz Bay in 2 minutes). And it's only a short drive to St. John's spectacular National Park beaches. 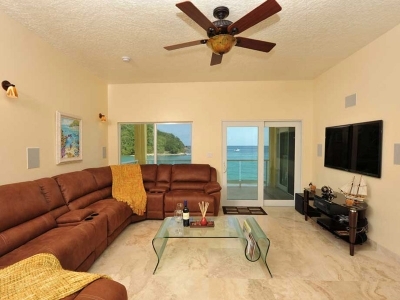 Seashore Allure is an excellent choice for your Virgin Islands vacation with family and friends.